What Burt Reynolds might take camping. The Toyota Land Cruiser dates back a whopping 60 years, which is Methuselah-like in terms of car years for a single model. The current version is solid, seriously off-road capable, and outfitted to keep a family in comfort in the great outdoors. It's also painfully old, having been in the current generation for over a decade. But instead of giving us a redesign, Toyota dresses one up and calls it the Heritage Edition. In this particular case, Heritage might just mean old. The Land Cruiser is perfectly at home in the great and sometimes rough outdoors. This particular special edition doesn't really change the model much at all except for some visual touches that set it apart from the regular version, which is also painfully pricey ($85,015 base MSRP). The first things you notice are the rally-style bronze-colored BBS wheels. These18-inch wheels also have a retro-style "Toyota" badge on the wheel cap. Though the wheels look good, they're a bit out of place on a big SUV. There's also a black grille that matches the paint, giving the behemoth a bit more menace from the front view. It looks good on the front fascia that was thankfully revised back in 2016, in addition to other design tweaks inside and out, in order to keep the model fresh during the latter portion of the Land Cruiser's seventh generation. Though the Heritage Edition isn't formally commemorating an actual anniversary, it does not do the longevity of the model having arrived here in the U.S. back in 1958. 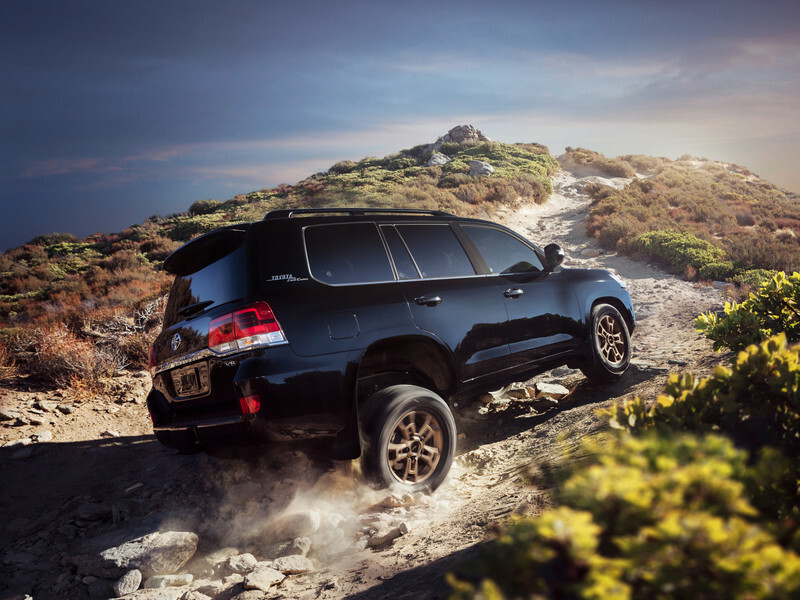 The coolest feature on the Heritage Land Cruiser isn't the wheels, nor is it the coloring highlights everywhere. It's the retro-fantastic "Toyota Land Cruiser" emblem on the D-pillars. We love it. The Toyota font is old school italic that's asymmetrically underlined with an offset cursive "Land Cruiser" logo beneath it. It evokes the same badging on the original Jeep-like Toyota FJ40 Land Cruiser. The one aspect we really love is this vintage-style lettering on the rear pillars. Under the hood, not much has changed. The Heritage Edition is powered by the stock 381-horsepower V8, along with four-wheel-drive, Advanced Chassis Control, CRAWL Control, and off-road turn assist, all for the rougher moments of your family vacation. Don't forget that as much as the Land Cruiser costs, it's also truly rugged, having started out primarily as an off-road vehicle rather than a comfy family hauler. The Heritage also gets darkened chrome trim, white or black paint, deletion of the running boards, as well as the third-row seats for optimal cargo capacity. You can only choose black leather inside, and there are bronze stitching features on the seats, shifter, steering wheel, etc. Toyota also ditched the center cooler in order to add more storage space. Only 1,200 of these special editions for the states, which should last a while considering only 179 of them sold last month. The Heritage Edition will start selling this summer, but the price hasn't been disclosed yet. Expect it to be a tad pricier than the already expensive regular Land Cruiser.